Disney’s 1992 classic Aladdin had all of the building blocks of success—a family-friendly love story, cultural representation, a little mischief and a whole lot of magic. Though many were skeptical when the film’s forthcoming live-action version was announced—Do we need to remake every movie? Will Disney cast appropriate actors for what should absolutely be a non-white cast? How could anyone replace Robin Williams?—the 2019 adaptation has seemingly cleared every hurdle it’s faced thus far. With a few issues in production delaying news, the hype for Disney’s forthcoming adaptation has been slow to amass. However, with information finally starting to circulate, excitement has reached a dull roar—with that, read on for everything we know about the live-action Aladdin remake to this point. Those are some big shoes to fill … who’s in the cast? Smith’s Genie was controversial when first shown in first-look photos released by EW, given that he wasn’t, you know, blue. However, Smith has since cleared up the worries—Genie will certainly be blue, and mostly CGI, though there will be a human version appearing at points in the film. Filling in the rest of the cast are Marwan Kenzari as Jafar, Navid Negahban as the Sultan and Numan Acar as Hakim (one of Jafar’s henchmen). Nasim Pedrad and Billy Magnussen are taking on new roles—Dalia, Jasmine’s handmaiden and confidante, and Prince Anders, a suitor vying for Jasmine’s hand in marriage, respectively. Jasmine’s tiger Rajah, Aladdin’s companion Abu and the pesky parrot Iago will also all be included in the live-action reimagining, though the extent of their roles is unknown. I’m skeptical—do we have any shots of these characters in action? Other than the aforementioned first-look images, which show us Aladdin, Jasmine, Genie, Dalia, Jafar, Abu and the town of Agrabah, the only other visual we’ve seen is the film’s teaser trailer, embedded below. 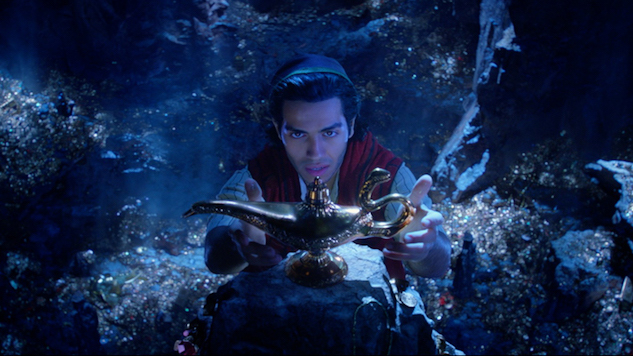 The teaser shows the fateful moment Aladdin enters the Cave of Wonders, finds Genie’s lamp and begins his hero’s journey. In addition, we get the first preview of Alan Menken’s reworked score—following a similar melody as the (legendary) original, in this case. Disney tapped Guy Ritchie (Sherlock Holmes) to direct back in 2016, with Dan Lin (The Lego Movie) producing. The choice to bring on Ritchie was interesting, considering his background with crime dramas and action-packed sequences, so all eyes are on the director to see how that translates here. John August (Frankenweenie) joined Ritchie in writing the screenplay. Menken (Pocahontas, The Little Mermaid, Beauty and the Beast, Tangled and, of course, the 1992 Aladdin) returns again to write the score. Further, the composer will also be collaborating with Oscar-winning duo of Benj Pasek and Justin Paul (La La Land) on two new original tracks. The actual production of the film was a bit of a mess—with principal photography pushed back from July to September 2017 due to issues casting the titular role. However, Massoud clearly was able to fulfill the role once cast and shooting wrapped in January 2018. Aladdin is scheduled to premiere on May 24, 2019. Until then, check out the movie’s poster below and check back here for updates as it gets closer to release.